Passwords are changing and going up in price on (or about) March 1st. If you have been putting off the major decision on whether or not to sped a buck you have a few days left to get one for $1. A password gets you into the screencast page the pdfs page and the advanced algebra page as well as the password test page which just has links to the pages where the password works. More stuff is being added, and more blog posts will be up this week...thanks for all your support. Start small and pretty soon this is EASY! This is just one activity among many. 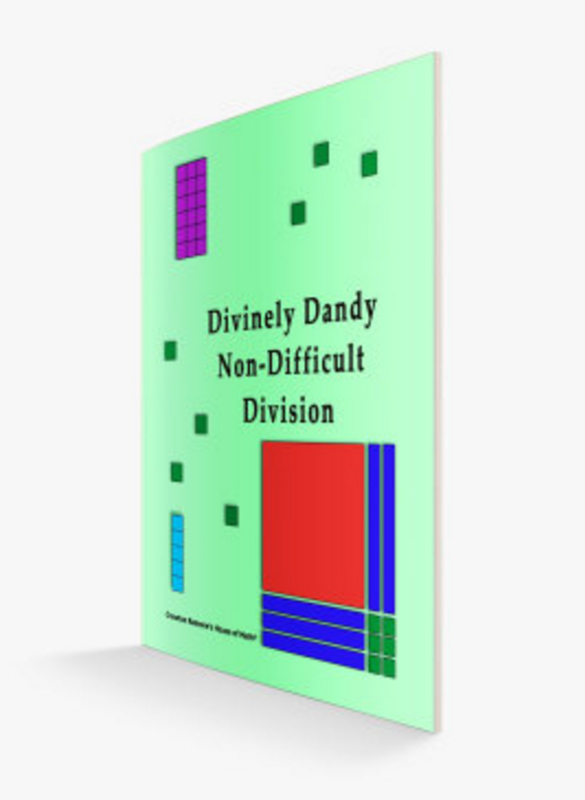 No need to spend day after day on division. That link takes you to the division page at the house of math. 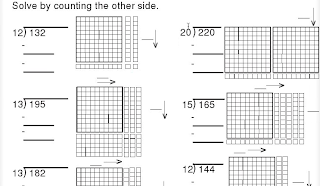 Here is a page with yet more videos and explanation regarding division with base ten blocks. I highly recommend you spend some time there if you are going to teach/play/fool around with division. Manipulatives make division EZ and you will find you get fewer complaints and more understanding if you use them. This is just more fooling with rectangles and counting the sides, in this case we know the whole rectangle and one side and just have to count the other side. We also have to remember to stop and record when we get to TEN. Here is the Password Protected PDF's Page. You need a password. They cost a buck till the end of the month. Update: Passwords at the cheapest cost ten bucks now (2014) and an annual password is 24 bucks which works out to 2 bucks a month. Take your time and digest all the stuff you get for free first, or at leaste a lot of it and then get a password. There's FREE worksheets and more at the house of math. The one in the vid on this page isn't though. Just another reason to get a password...when you're ready. No more excuses about having blocks and not knowing what to do or how to use them. Play blocks first and very quickly THEY will see (and if you are a clever teacher THEY will discover, YOU WON'T TELL THEM) the algorithm "multiply and subtract" when they see the symbols presented correctly. In kid culture it's very common to hear hear "I hate long division." There's no need for them to hate something so easy and obvious. And yes I'm on Twitter. Here is a quick screencast, less than five minutes showing two problems. Nine kids have 21 apples divided among themselves, they have three left over...how many apples does each kid get...? There's a lot more I would have said on the first one by way of explanation...but it was on the fly unrehearsed one take...the problem solving page goes into more detail because I'm sure after watching these which are NOT beginner problems you will have questions. For a more complete explanation on problem solving go to Crewton Ramones House of Math. How is it possible we can divorce multiplication from division or addition from subtraction...? Or visa-versa? 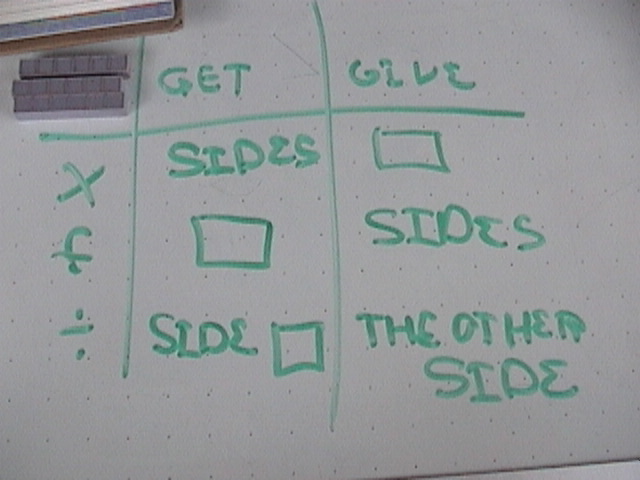 Here we start nice and small and add a little twist by talking about parameter and sides. This could be a nice beginner lesson for little kids and also a good lesson for older students. Here we can see that division and multiplication go together and that they are indeed inverse functions, play with it a little and area parameter (and volume) can be easily understood because they can be easily seen. Long division is despised among 5th and 6th graders...it should be easy as pie...but not the way we currently teach it. Which by the way is part of a methodology that is an UTTER FAILURE. Yet year after year very little changes. If you start small understanding simple problems like how many times is 2 contained in 8, bigger problems like how many 12's in 132 is also easy and then ones that have remainders like how many 6's in 341 or how many 23's in 687 are no problem. You also realize that you don't want to model every problem with blocks! Once you understand the concepts and have gone from blocks to pictures to symbols ANY problem is easy (or easier) with pencil and paper and "multiply and subtract" makes sense...you might also find students able to do the easy ones that have no remainders in their HEADS. In the conceptual method using base ten blocks little kids are exposed to division concepts at the same time they are learning to add and subtract because math is just counting and multiplication and division are just adding and subtracting very quickly...all of it is just counting. 35 divided by 7 is just counting sevens and even easier than that if we use blocks to make a rectangle it's just counting one side when we know the whole rectangle and the other side. Go to my division page which is under construction (along with the rest of the site) for more. You'll find this vid as well as a couple of others there. As you read and watch this know that worksheets are being created for both multiplication and division and they will soon appear on the pass word protected pdfs page...passwords are currently a buck but the password is about to change at the end of the month and the price is going UP. Currently a password gets you into the pdf's page where you can down load lots of different worksheets, onto a password protected screencast site that has algebra and percentages on it, as well as the advanced algebra page which at the moment isn't that exciting it just links you to the screencast channel and has some vids on factoring all in one place...but I am told it's MORE than worth the dollar, lol. people also tell me that the price is too cheap so people think there's no value there since it's only $1...and a buck doesn't get you anything anymore. Labels: base 10 blocks, Base 10 Manipulatives, base ten blocks, Division, Mortensen Math. More on completing the square and making it easy by using the simple concept of degree of difficulty. Next after this is mastered we can head on to the quadratic or take a side trip into graphing them and talking about vertex form...and h and k.
As I have said these are uploaded to both screencastomatic and my YouTube channel so if you can't see the screencast here look for it on YouTube. "Colby Completes The Square Part 1"
"Colby Completes The Square Part 2"
might actually cause some confusion as well as fear and trepidation because they don't know what the symbols mean. Students using base ten blocks and manipulatives know what that means because they can SEE it and rather than giving them rules and process and formula to follow they get an experiential understanding of what the formula means BEFORE they ever see the formula. THEN when they do see the formula it makes sense. When I say they don't need the symbols I mean they can hear the problems and do them in their heads...if they have paper and pencil it's even easier. The screencast mentioned in the second vid is not yet up on the password protected channel...it will cover the problems you see in green above in intricate detail...with blocks but mostly with drawing and lastly symbols. You need LOTS of practice before you move on to the quadratic formula. More free math worksheets are going up everyday. 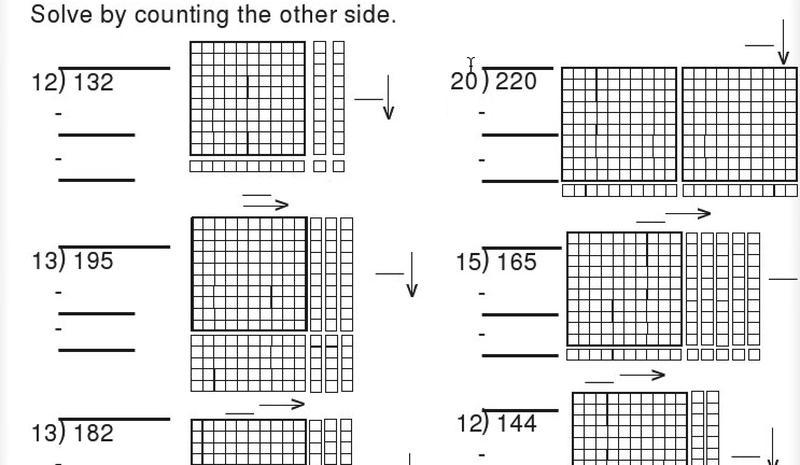 Check out this math worksheet page on my website, it has some good ones for use with base ten blocks. It uses the same color scheme that Mortensen Math uses that was also adopted by Math U See. As many pdfs as I put there is as many pdfs as you can down load. Like the screencast page you can watch as many times as you want for as long as your password works...which should be for 30 to 60 days, except on the PDFs page you aren't watching you are downloading. Here is a screencast covering just one of the worksheets you can find on the PDFs page that requires a password. It's two 20 page worksheets covering addends and also gives practice and instruction on how to write the numbers. Here is a FREE sample of it in color for practice with nines and tens. Like the one you see here. Math Bunny towing the line for Crewton Ramone's House Of Math. Caution screencast contains blatant sales pitch by a cute rabbit and contains subliminal messages. You may end up spending a dollar. Passwords are available here and here and here. More links to FREE stuff appear on the FB page. Labels: First Grade Math Worksheets, Fraction Worksheets, Mortensen Math. Another session with several high school girls doing typical high school algebra out of a common textbook. These girls are, as it turns out, 14. This one was there just for the fun of it, but it soon became clear she had an aptitude for algebra brought about by her not really having any anxiety over it because she was in a different (and lower) level class. We played around with algebra concepts and got quite a lot done. Perhaps too much for one session. (x + 1) 2 = 9 are EASY once you understand a little about squares an square roots. We also played with completing the square. Earlier on we did spend some time solving equations like you see in this video. Here we see the notation without the symbols, there is an extraneous 15 there which she used to help her figure out the factors we didn't set these equal to anything and solve for X we just factored polynomials. This girl--well spoken, obviously intelligent--has some issues with math due to a "F" or two on tests. She was able to make easy things hard because of her perception. Fortunately, she had a couple of friends there who were "getting it" which helped her think, "if they "get it" I can "get it" too." This is yet another reason to tutor in small groups. Laughter is the best cure for math anxiety. Covering negative expressions requires a password, I talk about the concept of opposites and combining however on the screencast, if you want more on how to do "the negative ones" you need to get a password which only costs a buck. Here is a the screencast, talking about group learning algebra and more. The thought you want to instill in the group is: "this is fun and easy." I have the same videos on screencast0matic and on Youtube as a back up hopefully if one is down the other is working...the name of this video is "Crewtonn Ramone Typical High School Algebra II"
Another 90 minute lesson with a 7 and 8 year olds...and as it turns out the last lesson for the little girl as she is moving away to California. Here we see her working on factoring various problems, basically making rectangles and counting the sides. While she is learning algebra she is also learning lots of other math facts, addends and multiplication too. As an added bonus she is being exposed to algebra. They worked on square ones and ones that were just plain ol' rectangles. Here is a shot of the little boys notebook. He was much prouder of the fact that he made his fives correctly than he was of factoring the polynomials... You can also see the transition from drawing to symbols. Completing this square was a lot of counting because they didn't now what 8x8 was. They got out the blocks and took a while to figure it out. The boy got to 32 and then doubled it...then we went back and counted by eights, 8 takes the 2 out of the next 8 for 16, 6 takes the 4 out of the next 8 for 24, 4 takes the 6 out of the next 8 for 32, 2 is happy to get an 8 for 40, then it's 48 and the pattern repeats, 8 takes the 2 out of the next 8 for 56, and 6 takes the 4 out of the next 8 for 64. Whew! That's some counting right there kids, I'll tell ya!.